The sweet scent of lavender lingers in the breeze, stirring something in your soul, reminding you of days gone by. Sweet giggles float through the air, when the sun creates a gorgeous summer glow & rays of light dance on the water. Where you take it easy & the world just happens naturally. Where a feeling a warmth blanket you - not just from the sun but from blissful, pure happiness that fills your soul as you go hooting & hollering down the dock like lightening, ready to cannon ball into the water below to your cheering friends. A time where fun is simple, carefree & the world seems frozen in time. Fireflies drift up towards the sky as you snuggle by the fire, toasting then smore’s and & now champagne with family & friends dancing & singing to your favorite old tunes. All the feelings are the same, but now you’re a little older & bring a refined sense of style & grace to these magical days. But don’t worry, those wild flowers you picked out in the field still find their way swept up in your hair & you know another marvelous adventure is about to begin as you stroll along, hand in hand. Sweet Bailey & Ben had a soft spot for Lake Burton, Georgia, the Tallulah River, & the majestic Smokey mountains surrounding it, so it was natural that they decided to celebrate their love with their friends & family there. As we chatted about her vision for their wedding suite, Bailey lovingly recalled oodles of memories of her & Ben's childhood summers spent at the lake, of being proposed to high in the mountains & how they couldn't wait to celebrate their love with their family & friends there, & all throughout the warm fuzzies of yesteryear kept shining through, so we decided to weave that magic nostalgia blended with southern hospitality into their beautiful suite. 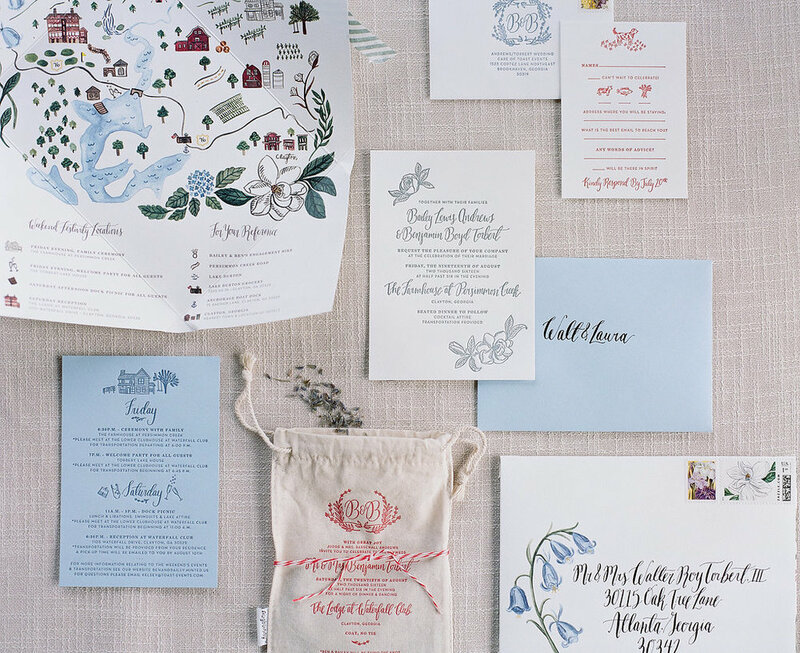 We transported guests to carefree, southern summer days at the lake, by delighting their senses with the sweet smell of dried lavender, the touch of screen printed linen bags & heavy cotton letterpress printed invitations. Guests were also welcomed with the sight of watercolor illustrated flowers (all inspired by those which grew in Bailey's childhood garden) & a modern twist on a classic southern monogram found throughout the couples special weekend. What a fabulous couple & a magical weekend! one!! 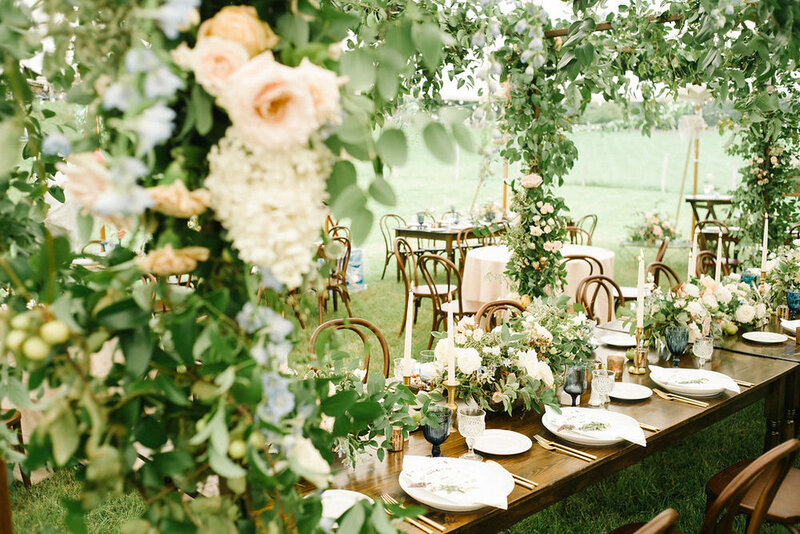 @abryanphoto @toast_events @balew@amyosabaevents @goodwinevents@12thtable @sovintagega @claudiamejerle@gavalet @waterfallclub @marchesafashion@sweetcarolines_cakes @brandonfilms@eptingevents @fromsirwithloveFarmhouse at Persimmon Creek!